Wargames: Defcon 1 is a real-time strategy (RTS) based on the famous film "War Games" directed by John Badham. The plot is set in the near future and shows the conflict between people and machines. Wargames is a real-time strategy game, based in the most part on the movie of the same title, in which a young guy breaks into military supercomupters, starting a simulation of USSR war activities against the USA. In Wargames, there are two sides of the conflict: humans (NORAD) and machines (WOPR), among which there are no meaningful technological differences. We have an entire campaign composed of 30 missions designed by the producer and the director of the movie, John, Badham. 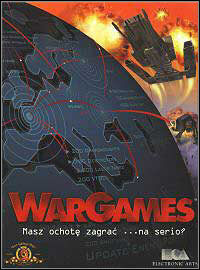 Wargames is the first RTS game to use 3D graphics. Over 100 units (land, navy, air) are given at our disposal. Hackers are the special units which are used to diversion activities in the commanding center of our enemy. The missions take place all over the world in such beautiful places as Alps or deserts. Game score 8.0 / 10 calculated out of 65 players' votes.